The Winery – Wield Yard together with the Vineyard, opens up a host of possibilities for entertaining clients, customers, charities, family and friends with personal or group tours, corporate away days or training, private dinners, larger receptions, talks, art shows… The potential for stylish entertaining is virtually unlimited. The Winery site offers a range of diverse events and entertainment options for corporate functions. 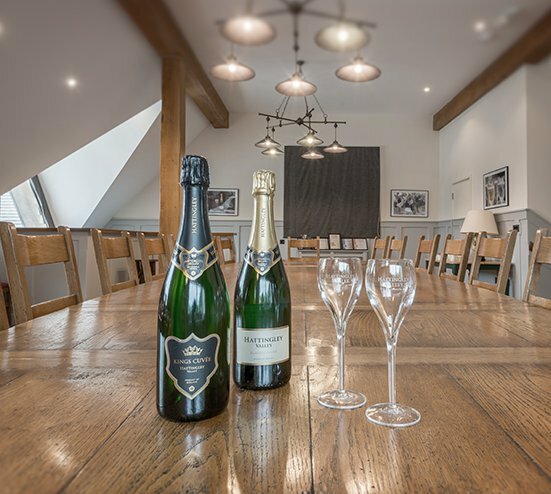 The Tasting Room provides a relaxed and attractive venue for those wishing to hold an informal reception, conference or sit-down meal for up to 20 guests. It is ideal for corporate “think-tanks” and training sessions. We are happy to arrange refreshments with anything from tea, coffee and water to a buffet or three course meal. Alternatively just down the lane, is the award-winning Yew Tree Inn. The venue is fully-equipped with kitchen and bathroom facilities; it is also stocked with all the necessary technology and presentation tools to make your event a resounding success. The Tasting Room can also be hired for private functions and provides a delightful venue in which to celebrate. We will work with you to plan your event and can make recommendations on caterers, florists, music, tented canopies, furniture and special effects. To explore how we can help you to enjoy the very best event at the Winery, please contact us.